I have been writing about new features of Java SE 8 from quite a sometime. Initially, my focus areas on much talked about lambda expressions and streams, but slowly I realized that Java 8 is not just about them, it's much more than that. It has many more new features and API enhancements which will help Java developers in their day-to-day job as much as lambdas and streams. One of such less talked feature is the ability to join multiple String objects into one separated with any delimiter. It has added a class called StringJoiner in the java.util package which we have seen earlier, but it has also added a new method on String class, the join() method, which finally allows you to join Strings in Java. You might have faced scenarios in past where you have a list of String or an array of String and you want to join them by a comma. Finally, the wait is over. JDK 8 has introduced a join() method which you can use to join any number of arbitrary String, an array of String or a list of String by a delimiter. Similar to String.split(), it is also a static method and you can call it as String.join(). It has two overloaded versions, one accepts a delimiter and number of String objects as variable arguments and other accepts a delimiter and an Iterable to join elements from array and list. 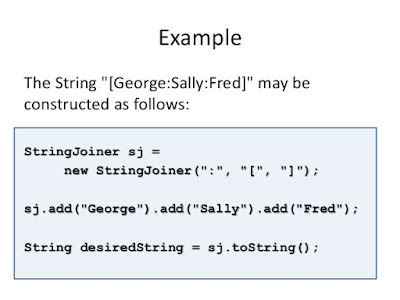 In this article, I'll show you a couple of examples of how to use join() method of String class to join Strings in Java 8 and you can always look back to a good Java course like The Complete Java MasterClass to understand more about these little gems from Java 8. It's one of the best course to learn Java and also most up-to-date, recently updated for Java 11 version. You can use the String.join() method to join a number of String literals, String objects, String elements from an array, or String elements from List, Set or any collection because it accepts an Iterable. This means all classes which implement this interface can use this join() method to join individual objects. You can also pass the delimiter of your choices like a comma, semicolon, pipe, or colon characters. You can see that the final String contains all three String literals separated by PIPE delimiter. You can see that the final String is a combination of all the individual String and they are separated by a comma. This is really handy and you end up using quite often. Btw, if you want to know more about such gems from Java 8 release then I also suggest you join What's New in Java 8 course on Pluralsight. Here is our complete Java program to demonstrate other features of String.join() method. It's a static method similar to split, so you can directly call them on String literal or just pass the String values you want to join. The program contains three examples, first to join arbitrary String literals, second to join elements from the list of String, and third to join elements from an array. * to join individual String and String form list and array. That's all about how to use String.join() method in Java 8 to join String. Now, no need to use any third party library e.g. Google Guava or Apache commons, you can join String by just using JDK itself. If you come across any other detail about String.join() method, please let us know. It's one of the interesting methods which will be soon as popular as String.split() is at the moment. Thanks for reading this article so far. If you like this Java 8 tutorial then please share with your friends and colleagues. If you have any questions or feedback then please drop a note. Looks like your payCompanies and typesOfCards output needs to be swapped. Indeed, thanks for pointing out, swapped now.